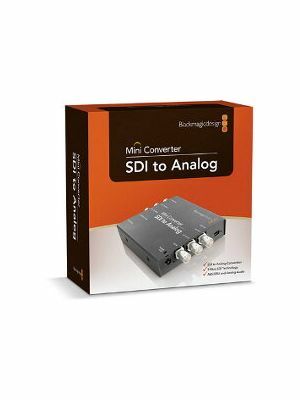 Mini Converter Analog to SDI is perfect for converting from analog video in HD/SD component, NTSC, PAL or S-Video to SDI video with the choice to embed SDI audio from balanced AES/EBU or analog audio inputs. 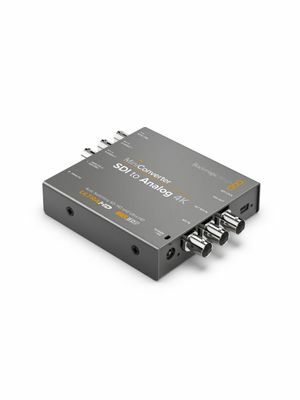 Mini Converters are built to the highest quality standards with low SDI jitter. You get the longest SDI cable lengths combined with ultra low noise analog video and audio for a true broadcast quality solution. You also get the latest broadcast technology such as re-clocking and 3 Gb/s SDI. Mini Converters feature a unique redundant input for mission critical tasks. Connect a redundant cable to the second input, and if the main SDI input is lost, Mini Converters will automatically switch over in an instant. A loop-through SDI output is also provided for connecting to other devices. With the latest 3 Gb/s SDI technology built into Mini Converters you get modern broadcast technology that's future proof. Upgrades can be loaded via the USB connection for future video format compatibility. Mini Converters instantly switch between all SD and HD video formats whenever the video input changes. A huge range of standards are supported including NTSC, PAL, 1080i/59.94, 1080i/50, 1080PsF/23.98, 720p/59.94, 720p/50 and new formats can be added via USB. Unlike other converters, a high quality low noise universal power supply is included with international socket adaptors for all countries. To stop power accidentally being disconnected, a cable tie point is included to lock down the power connection tight and secure! With Blackmagic Design's Mini Converters, it's as simple as using a pen to change settings. Settings vary between models, and include settings such as AES/EBU or analog audio, analog video connections, and more. All Mini Converters are similar, so they're super easy to understand and use. With advanced 3 Gb/s SDI technology, every Mini Converter is fully compatible with your SD and HD equipment, and can be updated via USB. Use our Converter Utility to make adjustments right from your laptop. SDI Video Outputs: Automatically matches the SD, HD and 3 Gb/s SDI video input. Analog Video: Component SD/HD, NTSC, PAL and S-Video. Updates and Configuration: Via USB 2.0 high speed. (480 Mb/s). SDI Compliance: SMPTE 259M, SMPTE 292M, SMPTE 296M, ITU-R BT.656, ITU-R BT.601 and SMPTE 297M for Optical Fiber SDI. Analog Format Support: 625/25 PAL, 525/29.97 NTSC, 1080PsF23.98, 1080PsF24, 1080i50, 1080i59.94, 1080i60, 720p50, 720p59.94 and 720p60. Copy Protection: For legal reasons, capture devices from Blackmagic Design are designed not to capture, convert or transmit video or audio from copy-protected sources, e.g. video devices using HDCP. Firmware Upgrade: Via included firmware updater application. Power Supply: 12V universal power supply included with international socket adaptors for all countries. Cable tie point. 1 x Cable tie point.